Bicycles transform the way many people travel, and save lives. On average a bike can do three times the speed of a pedestrian. In countries around, like Zambia, where walking is the primary mode of transport, a bike is life changing. Bikes enable more children to get to school, put food and clean water within the reach of more families, and help healthcare workers reach more patients. Healthcare workers can make trips 4 times faster by bike than on foot. This means they reach 15 patients in a week instead of five or six. In Zambia, 801,000 children have been orphaned, and 16.5% of adults live with HIV / AIDS. Communities depend on these health workers for life saving antiretroviral treatment and health education that reduces transmission. Bicycles reduce the barrier of distance and Zambians now receive better and more frequent visits. 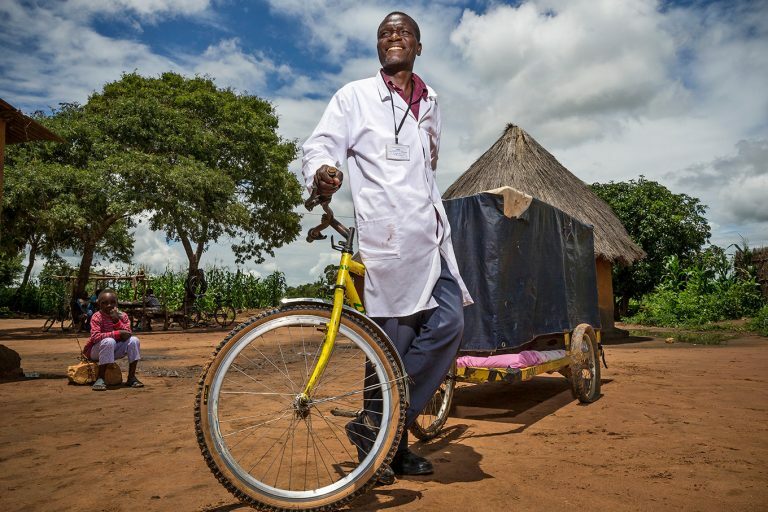 Healthcare workers are also able to use their bicycle to transport patients to a local clinic for further treatment. World Bicycle Relief has delivered 23,000 bicycles to 130 distribution sites across Zambia’s nine provinces and trained over 470 bicycle mechanics. This World Aids Day Bicycle NSW is drawing attention the contribution bicycles can make to bringing healthcare to people in need and helping to fight HIV /AIDS. Donate to the World Bicycle Relief here. Donate to the Aids Council of New South Wales (ACON) who help fund research into HIV and AIDS here. Donate to Australian Federation of AIDS Organisations (AFAO) who work nationally to defeat HIV and AIDS here.